A “connectome” is a map of all of the connections between the neurons (nerve cells) in your brain (see image below). 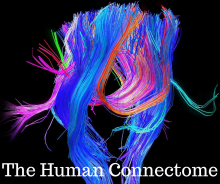 There are trillions of these connections and scientists are working to map them to unlock the keys to how your brain controls all aspects of your life—your behaviors, feelings (pain, fatigue, etc.) and even your thoughts. A detailed connectome map opens new possibilities and will allow a better understanding of how many diseases arise from “abnormal wiring” during brain development. This map could help us discover what causes chronic pain and fatigue to improve the treatment and even better to prevent it from occurring in the first place. Understandably, with all of the complexity of the human brain, developing the map will not be an easy process, but much progress has been made over the years.